Metal Detector is a device to locate hidden metal parts, pipes and electrical conductors on land and under water, usually has a electronic circuit and a coil. Previously we wrote about Radio-frequency Identification or RFID which uses the electromagnetic waves the allows automatic identification and localization of objects and living beings. RFID uses complex, targeted technology but per se Metal Detector has not much target or rather it can be used only where broader scanning is required to detect mere presence of Metal with some added exceptions by logical use of Physics. With the beginning of the 20th Century efforts were made to develop a device for localization of metals. Benefits promised mainly in mining. Physicist Heinrich Wilhelm Dove invented the induction balance system in the 19th Century, which was used in metal detectors a hundred years later the first system for usable metal detectors. The original induction balance coil system consisted of two identically placed coils, Compass Electronics produced a new design. Both coils were placed in a D-shape to form a contrasting circle. This system was used in the 1970s. At the same time, the pulse induction device came. In contrast to the beat-frequency oscillator or the balancing devices, the pulse induction device sends asynchronous high-voltage pulse signal in the ground. With the transmission of a pulse while the very minimum of time difference is measured, the result when the pulse encounters metal is when the voltage increases. Metal detectors usually consist of a battery-powered electronic circuit and a low frequency of alternating current flowing through the search coil, the magnetic field should extend as far as possible. The shape of the coil is to either flat (disc-or ring-shaped, double-D without core) or stretched (solenoid). The flat forms are used for screening of persons or floor surfaces, while the elongated shapes are used to locate objects in cavities such as boreholes or rock crevices. Electronic circuit and the coil are interconnected by means of a cable and generally are mounted on a linkage arm support. Pulse Induction Metal Detector : Here the coil periodically emits pulses of a magnetic field. These produce Eddy currents on the metallic objects in the vicinity of the coil. The Eddy currents in the receiving coil, in turn cause a signal change that can be measured as a voltage immediately after turning off the transmit pulse. Depending on the time, course and duration of the Eddy current responses to different ‘things’, from the length of pulses and pulse sequences different metals and size of the metallic objects can be approximately detected. The signal processing mostly is time dependent. AC Current Measurement Dependent Metal Detector : It is a continuous current in a most low-frequency transmit coil and is generated in the frequency range of 10 kHz. In the receiving coil, the reception of signal is analyzed according to the amplitude and phase. Furthermore, by using different transmission frequencies that can be transmitted simultaneously, followed by a further classification of search objects, preciseness can be increased. The different signal responses at different metals and materials raises the possibility of detection the materials. The primary factors to differentiate is the magnetic permeability and the electrical conductivity. Nonmetals differ materially from these metal material constants. In addition, the mobility of the charge carrier is important. The signal modification procedure is carried out and evaluated electronically and an optical or audible approximate scale (for example, various LEDs) or acoustic signal generator is triggered after a certain threshold value. In industrially used metal detectors, for example in the food industry for quality control and avoidance of metal fragments in food, automatic control is used. In airports and other sensitive areas to control or run a primary scanning of peoples. To find the position of metallic pipes and tubes in the floor and walls. In the food industry and the pharmaceutical industry to find metal fragments in the products. In treasure hunt to locate metallic objects, such as coins, jewelry, etc. In the archeology metal detector provides a valuable service in the initial guidance on excavation sites. Explosive ordnance disposal to detect landmines, unexploded ordnance, munitions and like that. Why Metal Detector Beeps Every Time For All ! 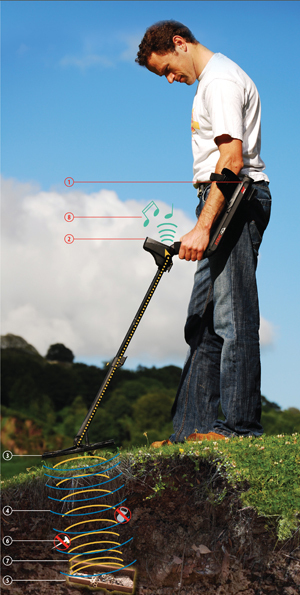 Apparently, it will look or feel that a hand-held Metal Detector beeps positively all the time for the most, which are used in public places. True, only the manufacturer’s training and practical experience of the person using are the guides. For example, a strong positive indication along with guessable possession (part of the body is important, as well as the feel by superficial touch) of a handgun can be detected easily. While a positive might also come out from a lady’s purse – it can have a plastic container with metal foil or a lipstick. Experience of the examiner matters because a person carrying something illegally might change his/her behavior. This are part of training of for Security, Surveillance job. Usually the devices are calibrated to avoid most commonly used objects which can trigger a false positive sign. This Article Has Been Shared 8629 Times! This is a great source of information on metal detectors and how they work. There are people who are into this kind of hobby because it’s fun and challenging. There are plenty of metal detectors available in the market, so there will always be one that will suit one’s budget and needs. How they work is easy to understand so there won’t be any problems how to use them. Cite this article as: Abhishek Ghosh, "Metal Detector : How it Works," in The Customize Windows, October 18, 2013, April 23, 2019, https://thecustomizewindows.com/2013/10/metal-detector-how-it-works/.